In conjunction with their April concert, the Thalia Symphony Orchestra is hosting an appreciation of Frances Walton and her enormous contributions to the Seattle musical community. Frances is, almost literally, a force of nature. Talented, enthusiastic, supportive and with an abundance of energy that seems inexhaustible, she has over the years left her mark as a performer, groundbreaker, educator, founder and musical mentor in the Pacific Northwest. Frances Walton was born in Inglewood California in 1928, and began playing piano as a child. By her teens she won a competition that led to a trip to the Tanglewood Festival. While there, Frances accidentally stood in the wrong line – a group of conducting students awaiting evaluation. Virtually without warning she found herself conducting the Grieg Piano Concerto and being observed by Leonard Bernstein. Obviously she did it well, because she was accepted as the only woman in a conducting class mentored by Bernstein. That incident began a lifelong involvement with conducting. Frances’ drive to achieve is shown in another way – as a young person she developed a love of swimming, an enthusiasm so great that by the time she was 20 she was the second seed on the US Olympic Swimming Team, preparing for the 1948 London Olympics. Sadly, her mother was struck by a car and seriously injured just before she was due to leave, and Frances decided to forgo the trip. Fortunately her mother recovered, and interestingly, the third seed swimmer who replaced her won a silver medal. Frances completed a degree in piano performance from Washington State University, did additional studies at the Los Angeles Conservatory, and at 27 she began to play the cello, at which she also excelled. During the 1950’s she began a working relationship with Mikael Scheremetiew, conductor of the Thalia Symphony. Along with featuring Frances as a cellist, he gave her opportunities to conduct – this at a time when the idea of a woman on the podium was unusual and a bit shocking. She served as Thalia’s Associate Conductor from 1954-1973 and headed the orchestra from 1973-1977. 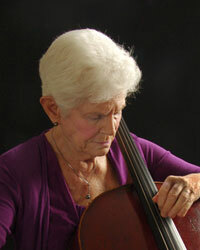 Frances was a founder of the Thalia Chamber Orcheatra – now Philharmonia Northwest – the Thalia Youth Symphonies – now the Bellevue Youth Symphony Orchestra – the Olympic Music Camp, a summer program for young musicians which ran from 1964-1997; the Mercer Island Little Symphony, Issaquah School District String Program, and the East Lake Youth Symphony. Today, although she may be less active in her eighth decade, Frances Walton continues to be a passionate promoter, lover, and performer of music. She will be honored by a pre-concert luncheon and will conduct part of the program for Thalia’s Opera Gala concert on April 1st. The concert begins at 2:00 PM in Seattle’s Town Hall, 1119 Eighth Avenue (at Seneca Street) Seattle, WA.